Acoustics By Design was retained by A.M.D.G. Architects to offer acoustical consulting services for this private residential cottage. 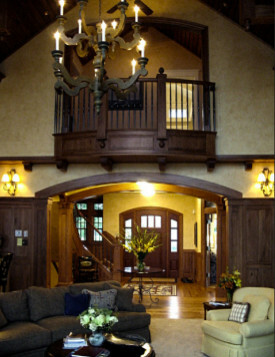 Our primary objective was to create a hospitable acoustical environment for entertaining. The client recognized the importance of good acoustics in creating a stress-free, relaxing environment, so designing this space with a pristine aural response was a must. Our professional engineers analyzed the ceiling plan and interior elevations in an effort to reduce noise disturbances, increase speech intelligibility, and create a warmer, less reverberant acoustical environment. After full implementation of our plan, the cottage became a relaxing environment for all to enjoy.